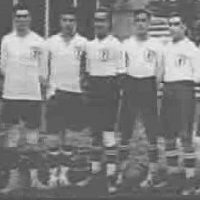 » "Could the Danish Flag have a Galician origin?" » I'd like to buy this flag! The red cross over a white field is the most popular Christian cross of all times. The cross is the symbol of Christianity and God's protection; the white colour is the symbol of purity and the red colour symbolises the blood of Christ. 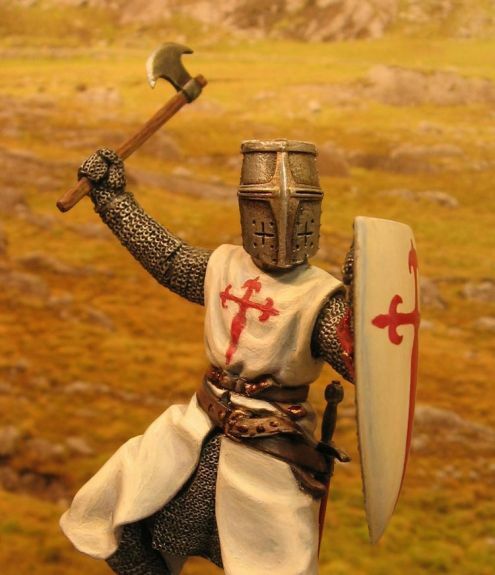 The red cross over a white field was used regularly during the Middle Ages, among others, by the French crusaders (which had the largest army fighting in the Crusades), the Knights Templar, and also as the national flag of England since the 16th century. 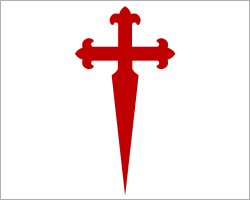 From Christian Red Cross to Christian Red Sword: The Christian Flag depicted in the "Book A" of the Cathedral of St James of Compostela was eventually transformed into a sword-cross as symbol of the Military Order of Santiago. Traditional iconography: St James the warrior with the Cross of St James of Compostela (left), and mediaeval knight dressed in an outfit with the Cross of St James of Compostela (right). In the Book A ("Tombo A") kept at the Cathedral of Santiago de Compostela there is a 12th century depiction of a dubious Battle of Clavijo between Christian and Muslim armies. In that picture we can clearly see a red cross flag flying over the tent of the Christian king. 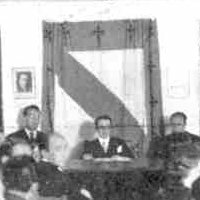 That flag, allegedly used as a royal standard by Christian king Ramiro, is directly linked to the cult of St James, the Patron Saint of Galicia, who is allegedly buried in Galicia's capital city, Santiago de Compostela. Galicia was the only kingdom of the Iberian peninsula which was not conquered by the Muslim armies. The Galician kings of the time worshipped St James or Saint Jacob (Sant-Iago, as he is called in the Galician language), for they believed that the Compostellan apostle was granting them holy protection over the Muslim armies. King Ramiro's father, Afonso II Galletiae Rex (813-842 AD) promoted the cult to St James in Galicia, where the remains of the Holy Apostle had allegedly been found. 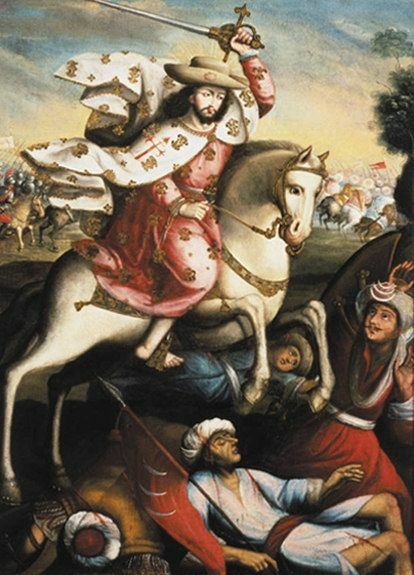 His son Ramiro I (842-850 AD) became the leader of the Christian army in the Battle of Clavijo, and the legend has it that the king asked the Patron Saint of Galicia for help in order to gain victory over the Muslims. 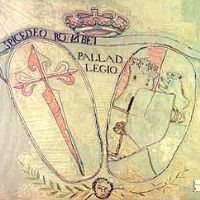 Thereafter, the red cross depicted in the 'Book A' of the Cathedral of Santiago de Compostela evolved into a red sword, and from Galicia it was exported out to the iberian kingdoms of Leon, Portugal and Castile, where St James became a Muslim slayer who helped Christians to gain victory over their islamic neighbours. This Galician cultural export became eventually the symbol of the Military Order of Santiago, a Christian knighthood founded in the 12th century in the kingdoms of Castile and Portugal for patrolling their borders with Muslim Spain. The red sword-cross known as the "Cross of St James" is represented as a red cross flory or flowered cross over a white field, where the shape of the cross is actually the blade of a sword. 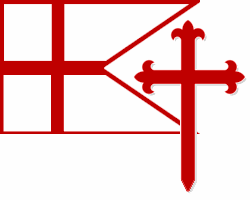 The military red cross of St James of Compostela is one of Galicia's oldest national symbols and can often be found in Galician heraldry and iconography. In his excellent book of Galician-Scandinavian relations (Gallaecia Scandinavica, Galaxia Publishers, 1986) Dr Vicente Almazan suggests a historical connection between the origin of the Danish flag and the cult of St James. According to Danish tradition, the flag of Denmark fell from the sky during a battle fought around 1219 AD between Danish Christians and Pagan Estonians. As the white cross flag was given to the Danes, a voice in the sky told the Christian army that they would win their fight over the pagans. The voice in the sky was right and the Danes defeated the Estonians. Some centuries before that miracle happened, St James was already showing himself in the sky to the Christians while promising military victory over the Muslims. That occurred in the before-mentioned Battle of Clavijo (844 AD) as well as in many other battles like Simancas (939 AD), Ourique (1139 AD), Navas de Tolosa (1212 AD) or Alcacer do Sal (1217 AD). In those days, the city of Santiago was the spiritual capital of the Christian world. During the Middle Ages the religious capitals of Christendom were Jerusalem in the East, Rome in the centre, and Santiago in the West. Since the 12th century, the Pilgrimage to Santiago became more popular among Christians than Rome and Jerusalem. Among the Scandinavian pilgrims to Jakobsland (as they called Galicia) there were kings, earls, saints, bishops, and many thousands of soldiers and crusaders. In 1108 AD King Sigurd of Norway wintered in Galicia with his army of 60 ships and several thousand soldiers. In 1152 AD Earl Rognvald of Orkney spent the winter in Galicia with an army of 15 ships and one thousand men. Many thousands of Scandinavian crusaders stopped by in Jakobsland to whorship St James while on their way to Holy Land for the Crusades of 1189, 1197, 1217 and 1229. Precisely, during the 1197 and 1217 campaign, Danish crusaders joined in the battle for Silves (1197) and Alcacer do Sal (1217) where, according to tradition, they witnessed St James in the sky promising victory to the Christians. 1) The legend of the Danish cross falling from the sky in a battle against the pagans is similar to previous legends of St James showing himself in the sky during battles against Muslim armies. It is also a matter of fact that Danish soldiers were fighting in battles against the Muslims, such as in Alcacer do Sal (1217 AD), where St James also showed himself in the sky. 2) The oldest known Danish flag is the Flag of the Scandinavian Union of 1427 where, next to the Scandinavian cross, there was a large St James dressed as a pilgrim and holding his typical scallop shell, just in the way he was originally represented in Galicia. What was the Patron Saint of Galicia doing in the Flag of the Scandinavian Union? Dr Almazan also brings to our attention that the scallop shell of St James is a very popular feature in the heraldry and coats of arms of Denmark. The Flag of the Scandinavian Union from 1427 AD, showing the national arms of Denmark, Sweden, Norway and Pomerania. The saint accompanying the Virgin Mary and infant Christ is the apostle Saint James, who is holding his typical scallop shell as depicted widely in the Galician iconography. 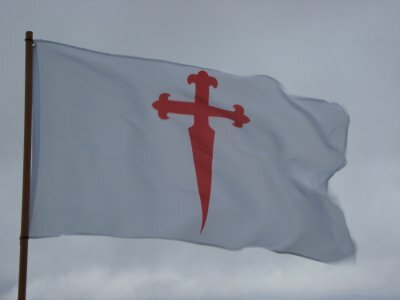 Flag of the Cross of St James of Compostela, made in polyester with two metal rings to allow the flag to be hoisted on a flagpole. The flag measures 150 x 90 cm.